IRELAND’S LATEST NEWS programmes will launch tonight on UTV Ireland. The two programmes are a key part of UTV Ireland’s schedule and the new station is aiming to draw in a large audience for its news and current affairs coverage. The first of the two shows is Ireland Live which is anchored by Alison Comyn and will be broadcast every weekday from 6.30pm to 7pm. The programme will avoid going head-to-head with the first thirty minutes of the competing Six One News on RTE One. Ireland Live at 10, co-anchored by Comyn and Newstalk presenter Chris Donoghue, will run for one hour between 10pm and 11pm every weekday. 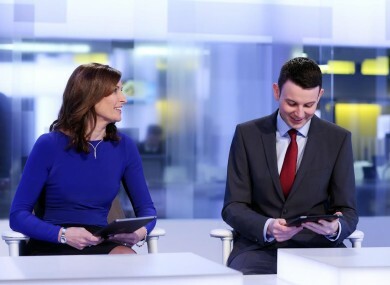 UTV Ireland says Ireland Live will focus on breaking news from across the country, while Ireland Live at 10 will have in-depth analysis and debate on the news stories of the day. Both programmes will be broadcast live from UTV Ireland’s studios in Dublin’s docklands. Chris Donoghue has said he will continue to co-host the morning programme on Newstalk which runs from 7am – 10am. “We are all itching to get on air and I look forward to making my television news broadcasting debut,” Donoghue said. Mary Curtis of UTV Ireland said that the station has invested ‘significantly’ in its news and current affairs coverage. “Over the past number of months, we have recruited some of the best journalists and news production staff in the Irish broadcasting industry and we have established news teams and bureaux across the country to ensure a nationwide service,” she said. UTV Ireland launched on 1 January. Email “Here are the details on Ireland's latest news programmes which start tonight ”. Feedback on “Here are the details on Ireland's latest news programmes which start tonight ”.